What is the difference between \somecmd and \csname somecmd\endcsname?
! Argument of \SOUL@@ has an extra }. I switch to package ulem where \uline can underline \fbox. Everything works (see MWE below). Then I try to make colorful box. However, I find that once I include package xcolor or tcolorbox (as the comment in MWE), some weird error comes up immediately even before I actually use them in the document. %%% uncomment either of the packages below, it reports errors. After all my efforts, I can not figure out why and solve it. So I updated my original problem. 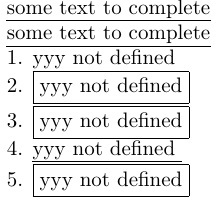 The \mygetdef needs to be expanded before being passed to \ul. The command \ul is defined as \SOUL@ulsetup\SOUL@. The first command sets up some commands that will be later delivered after a group has started and is of no concern here. Quite a mouthful! The behavior depends on whether the token stored in \SOUL@@ is a left brace or not. In your case it isn't. which is not really what you want, but can be easily fixed. My proposal is to define differently \mygetdef, if you plan to use it after soul macros, but not only. Not the answer you're looking for? Browse other questions tagged soul csname or ask your own question. What causes the difference appearance by the useages of two “csname…endcsname”? 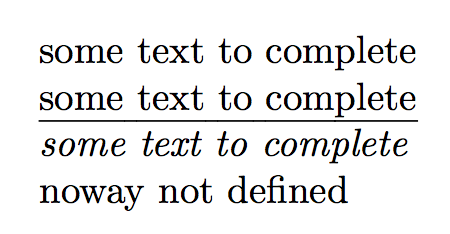 Why can I not use \string to prevent the expansion of \csname?